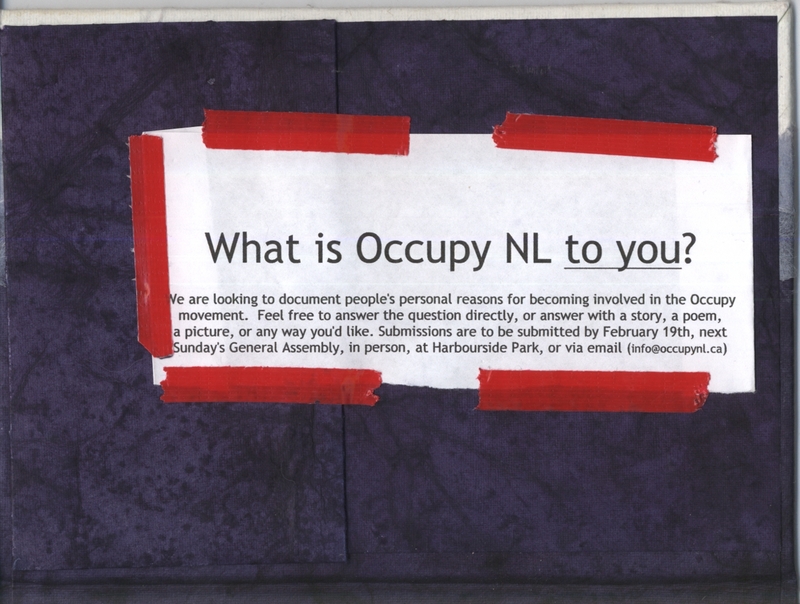 Occupy Newfoundland and Labrador: What is OccupyNL to you? 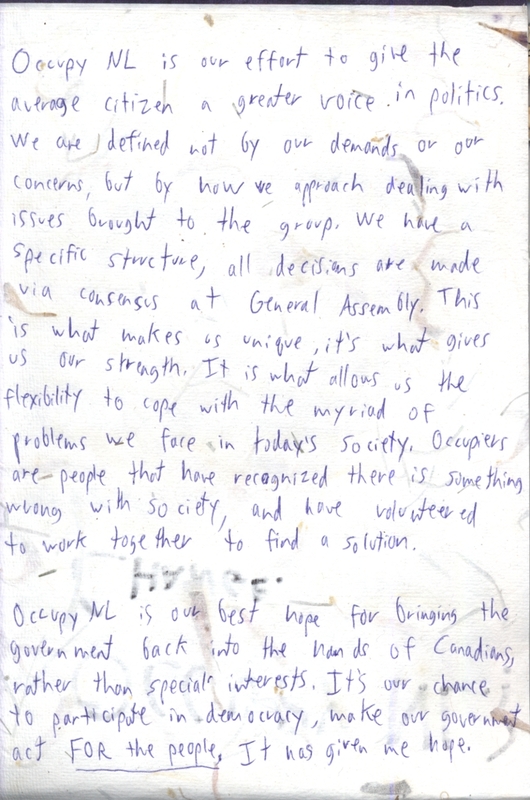 What is OccupyNL to you? 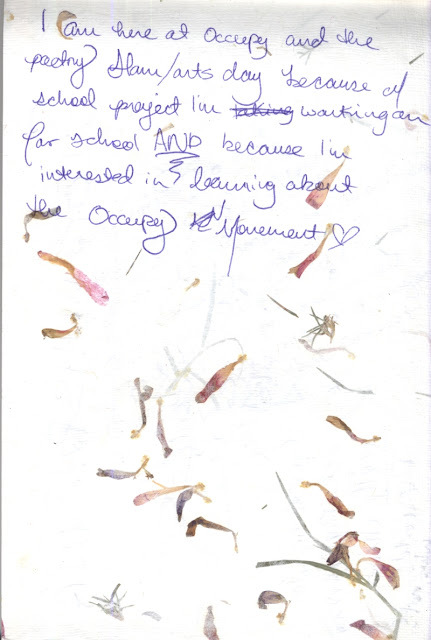 This is our attempt to discover and document people's personal reasons for getting involved in the Occupy movement. 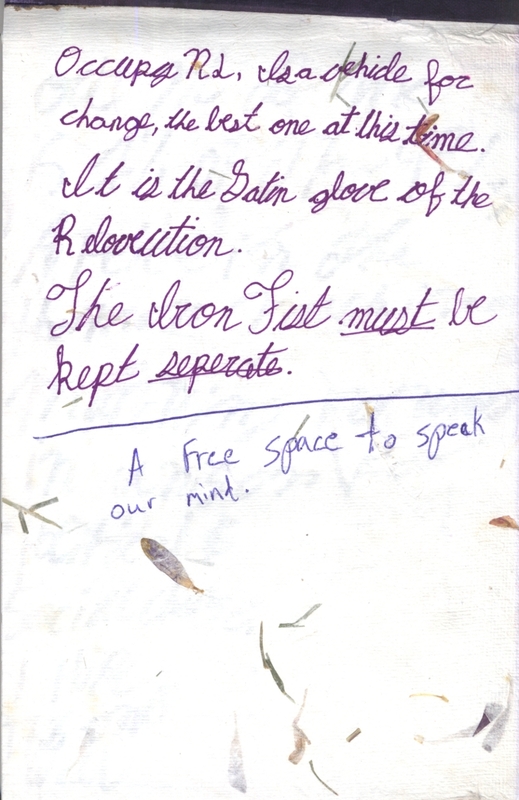 On the inside cover of the journal, we find the invocation, and the invitation. 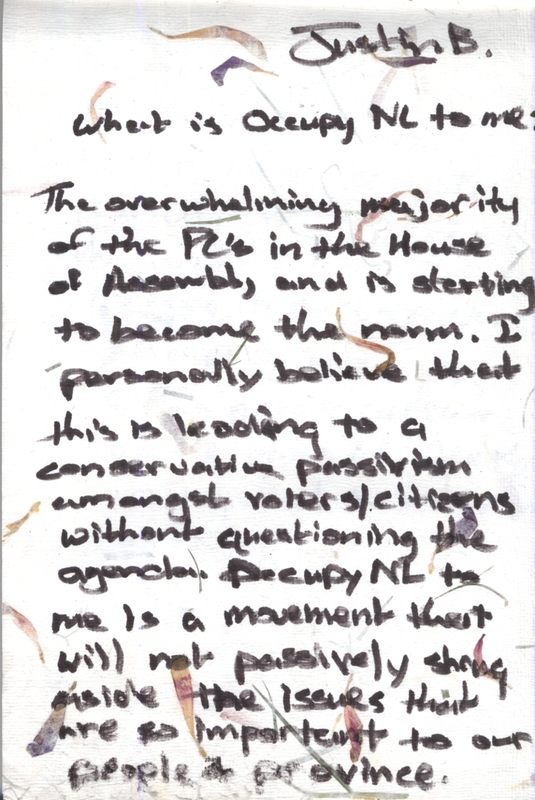 "Occupy NL is a vehicle for change, the best one at this time. It is the Satin glove of a Revolution. The Iron Fist must be kept separate." 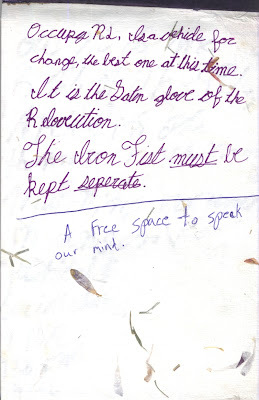 "A free space to speak our mind." 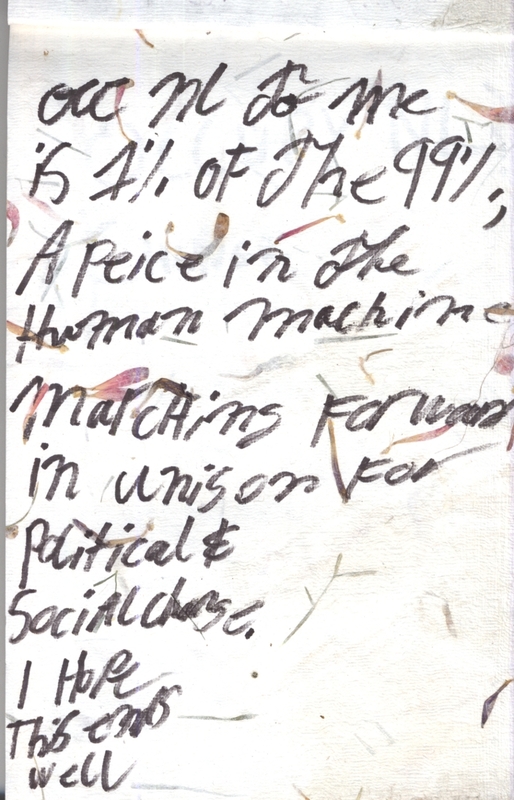 "Occ[upy] NL to me is 1% of the 99%, a piece in the Human Machine marching forward in unison for political and social change. I hope this ends well." 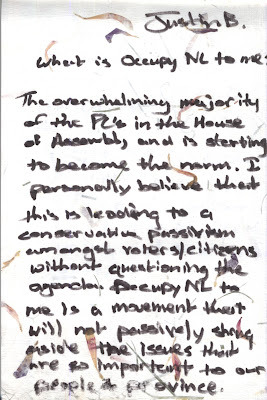 "Occupy NL is our effort to give the average citizen a greater voice in politics. We are defined not by our demands or our concerns, but by how we approach dealing with issues brought to the group. We have a specific structure, all decisions are made by consensus at General Assembly. 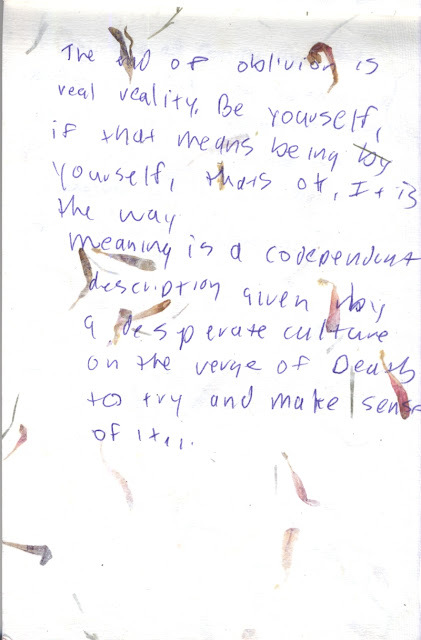 This is what makes us unique, it's what gives us our strength. It is what allows us the flexibility to cope with the myriad of problems we face in today's society. Occupiers are people that have recognized there is something wrong with society, and have volunteered to work together to find a solution. Occupy NL is our best hope for bringing the government back into the hands of Canadians, rather than special interests. 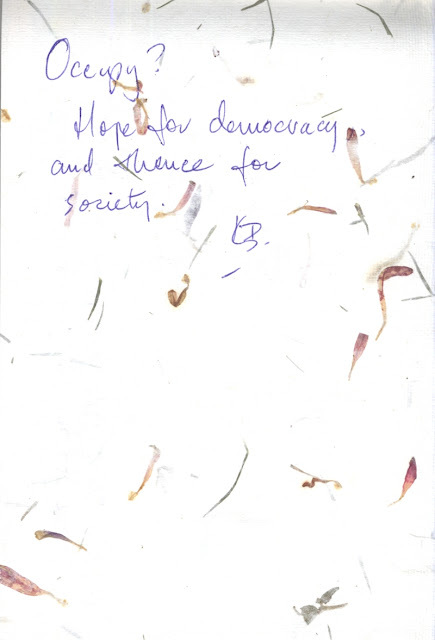 It is our chance to participate in democracy, make our government act For the People. It has given me hope." The overwhelming majority of the PCs in the House of Assembly and is starting to become the norm. I personally believe that this is leading to a conservative passivism (sic) amongst the voters/citizens without questioning the agenda. 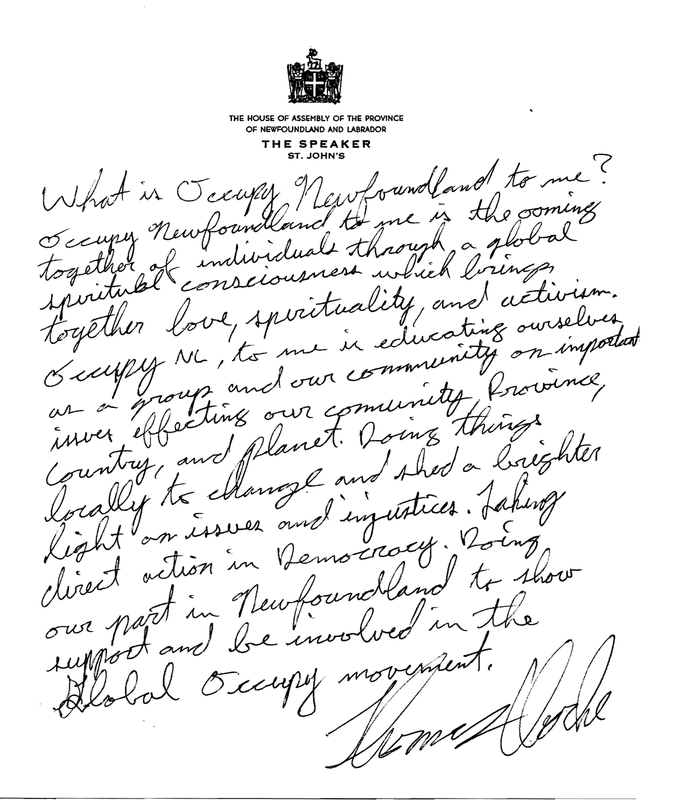 Occupy NL to me is a movement that will not passively shrug aside the issues that are so important to our people and province." "The end of oblivion is a real reality. Be Yourself, if that means being by yourself, that OK. It is the way. Meaning is a codependent description given by a desperate culture on the verge of Death to try and make sense of it." "I am here at Occupy and the Poetry Slam/arts day because of [a] school project I'm working on for school AND because I'm interested in learning about the Occupy Movement." 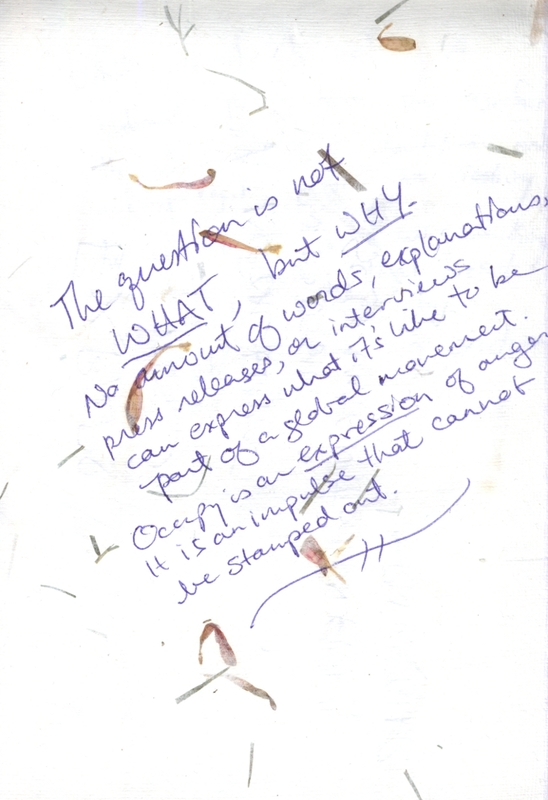 "The question is not WHAT but WHY. No amount of words, explanations, press releases, or interviews can express what it is like to be part of a global movement. Occupy is an expression of anger. It is an impulse that cannot be stamped out." "What is it to me? 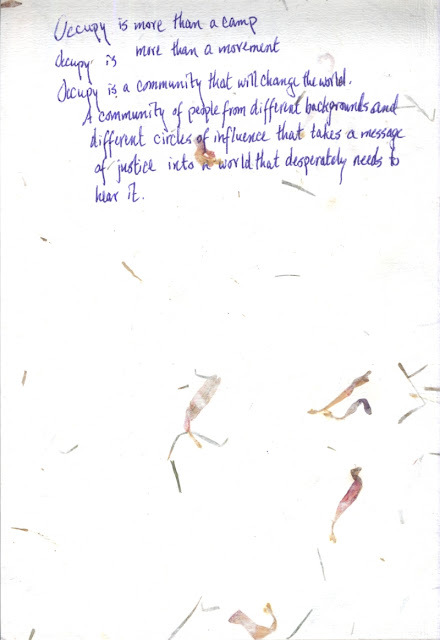 A statement that is below the 'surface', the skin of things reported-on and acknowledged. 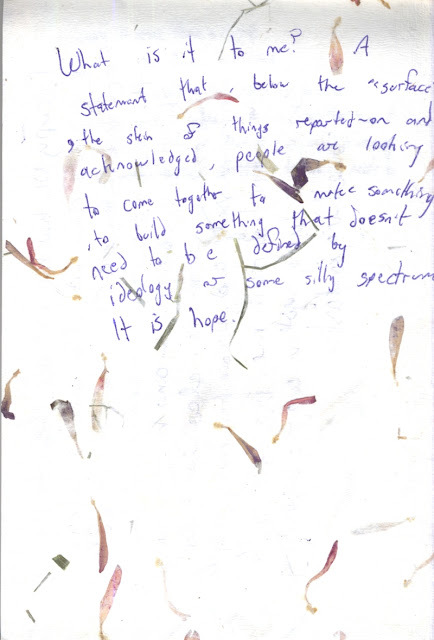 People are looking to come together to make something, to build something that doesn't need to be defined by ideology or some silly spectrum. 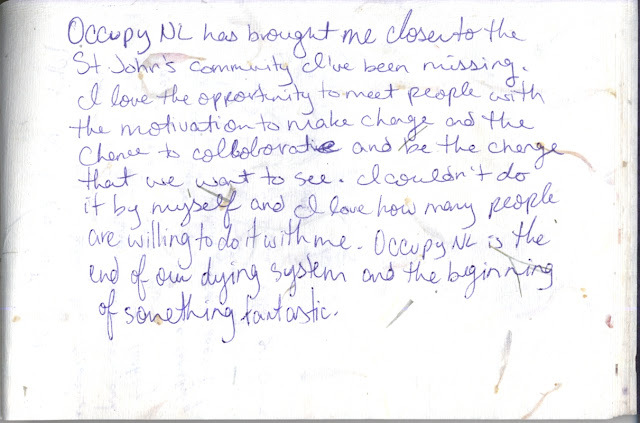 "Occupy NL has brought me closer to the St. John's community I've been missing. 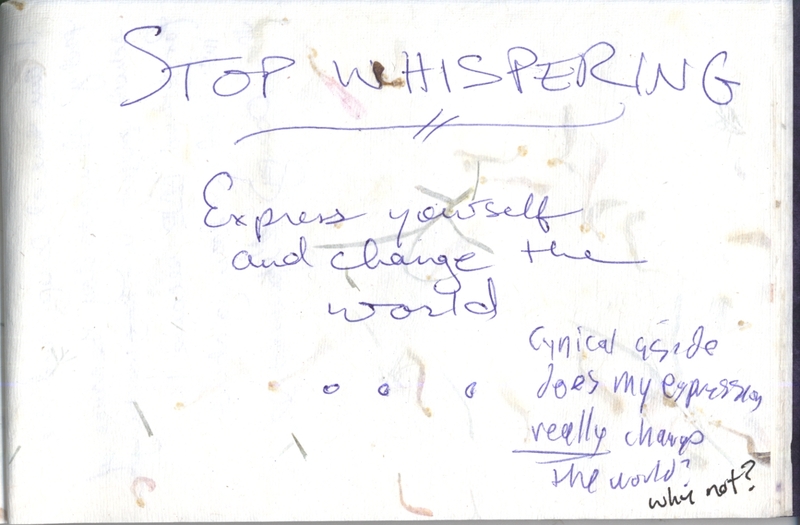 I love the opportunity to meet people witn the motivation to make change and the chance to collaborate and be the change that we want to see. I wouldn't do it by myself and I love how many people are willing to do it with me. Occupy NL is the end of our dying system and the beginning of something fantastic." "Occupy is more than a camp. Occupy is more than a movement. Occupy is a community that will change the world. A community of people from different backgrounds and different circles of influence that takes a message of justice into a world that desperately needs to hear it." Hope for democracy and thence for society." "Love is the extension of the self to include the other." 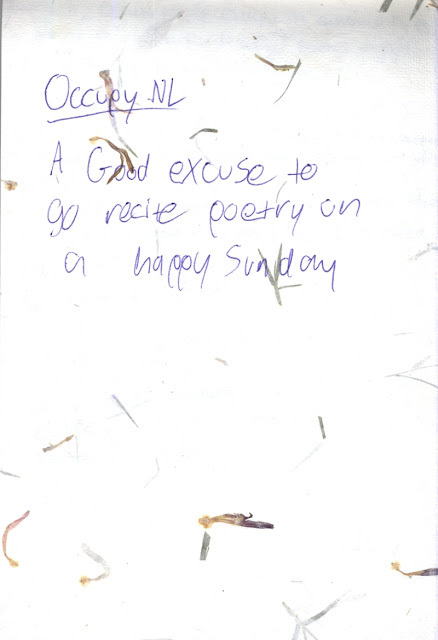 A Good excuse to go recite poetry on a happy Sunday." 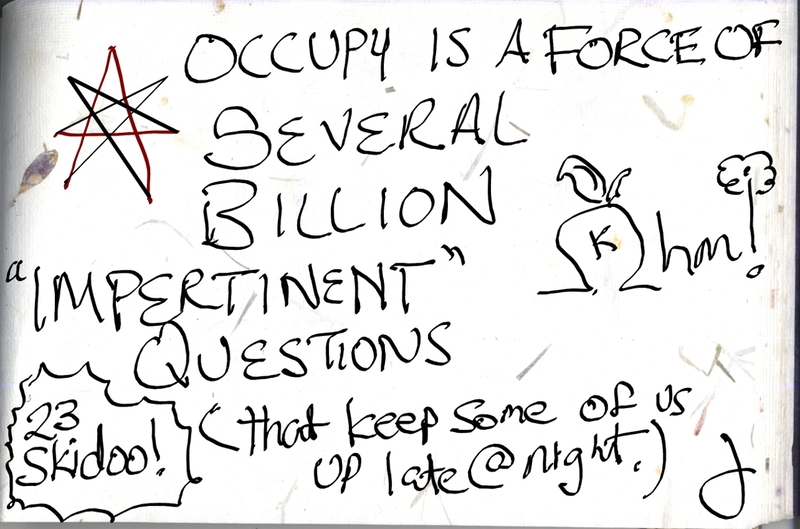 "Occupy is a force of several billion 'impertinent' questions (that keep some of us up late [at] night)." 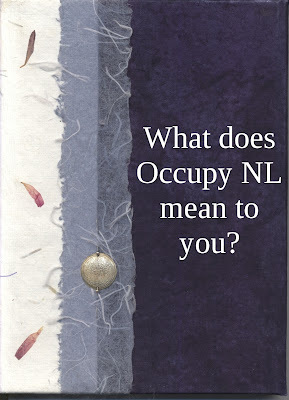 "For me, Occupy NL (& Occupy in general!) is a means to act authentically and become engaged - not that the two are mutually exclusive. Studying politics lead to my ... disillusionment, I guess one could call it. I don't understand how someone could wish to manipulate and benefit - surely an inauthentic venture! 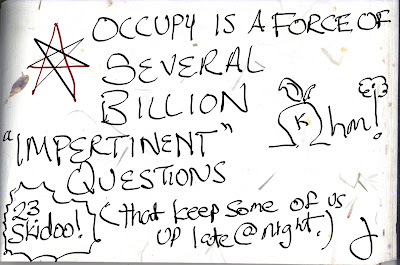 In short, Occupy represents a kind of participation that I feel is real and true and sincere, for whatever reason, that what I feel is important. 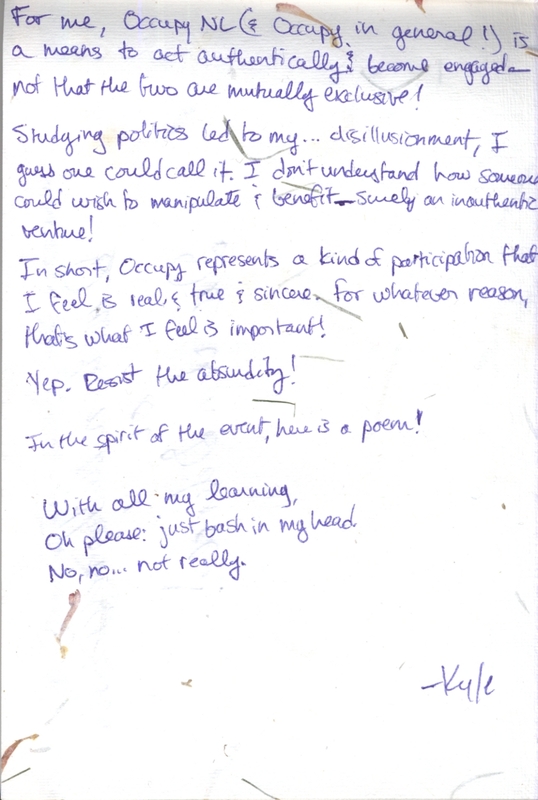 In the spirit of the event, here is a poem! "A new step with the humans marching forward." The O in Occupy. [represented] the three wholes of community. Occupy is the Debute [sic] of originality. 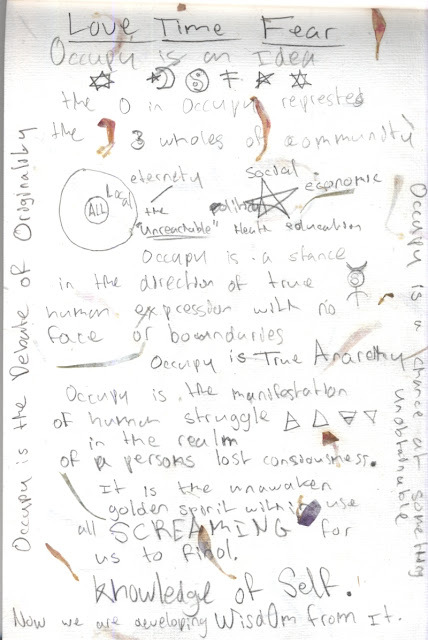 Occupy is a stance in the direction of true human expression with no face or boundaries. 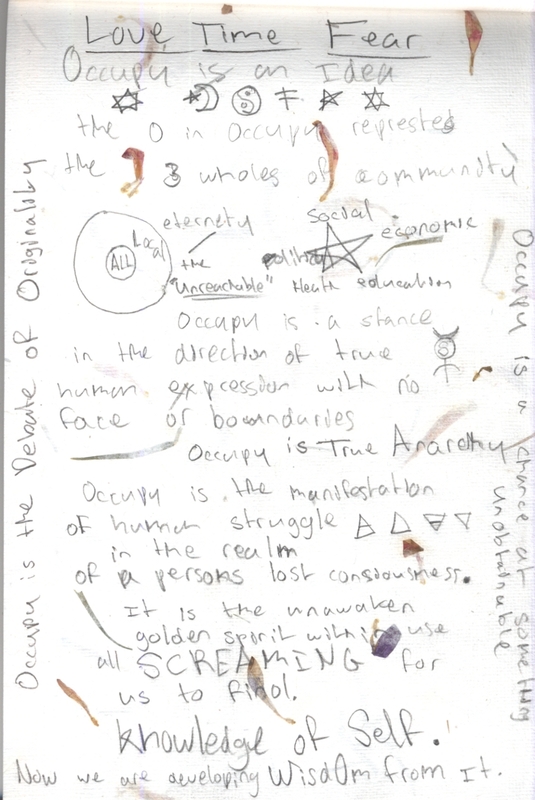 Occupy is the manifestation of human struggle in a realm of a persons lost consciousness. It is the unawakened golden spirit within us all SCREAMING for us to find Knowledge of Self. 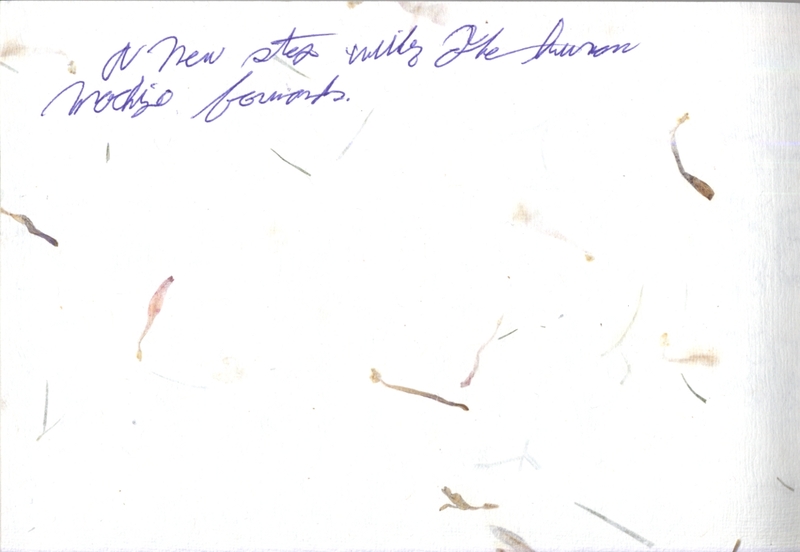 Now we are developing Wisd0m from it. 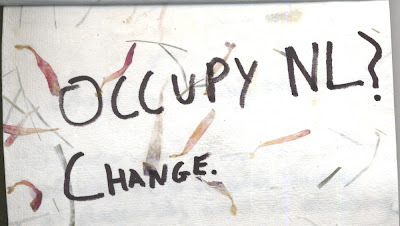 Occupy is a chance at something unobtainable." What is Occupy Newfoundland to me? 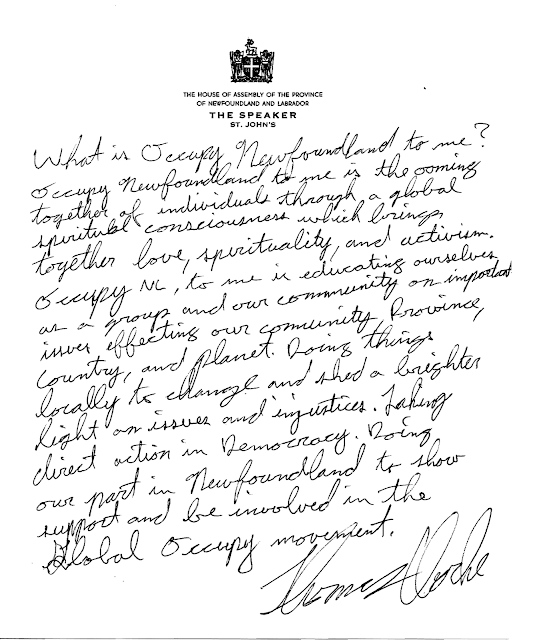 Occupy Newfoundland to me is the coming together of individuals through a global spiritual consciousness which brings together love, spirituality, and activism. 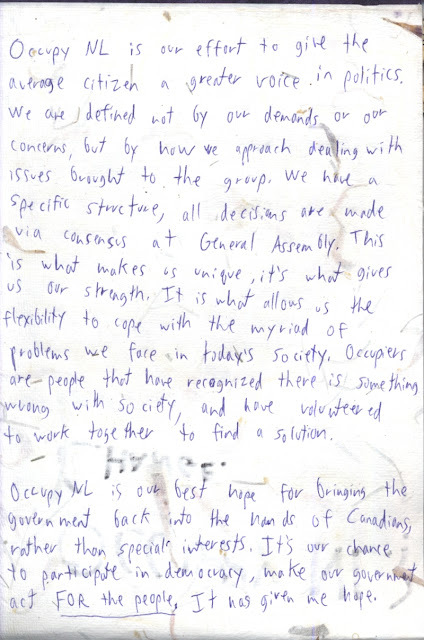 Occupy NL, to me is educating ourselves as a group and our community on important issues effecting our community, province, country, and planet. Doing things locally to change and shed a brighter light on issues and injustices. 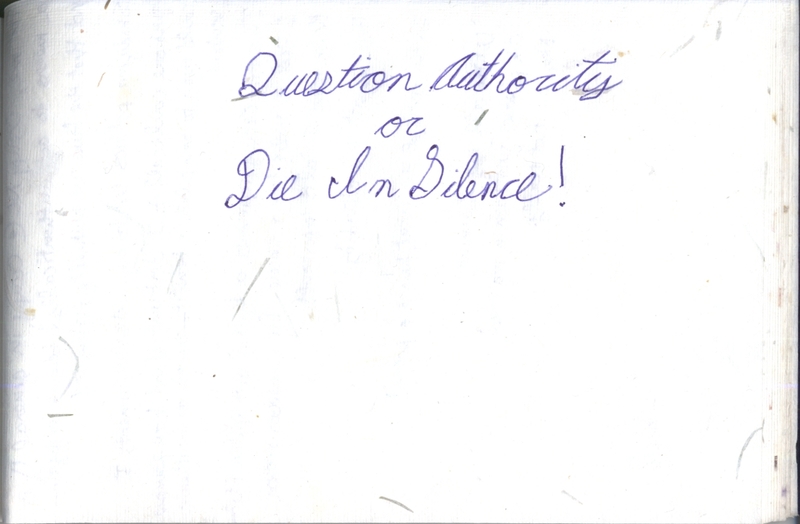 Taking direct action in Democracy. Doing our part in Newfoundland to show support and be involved in the global Occupy movement. "Occupy NL is a spontaneous upsurge of creative energy, a kind of poetry of social action. 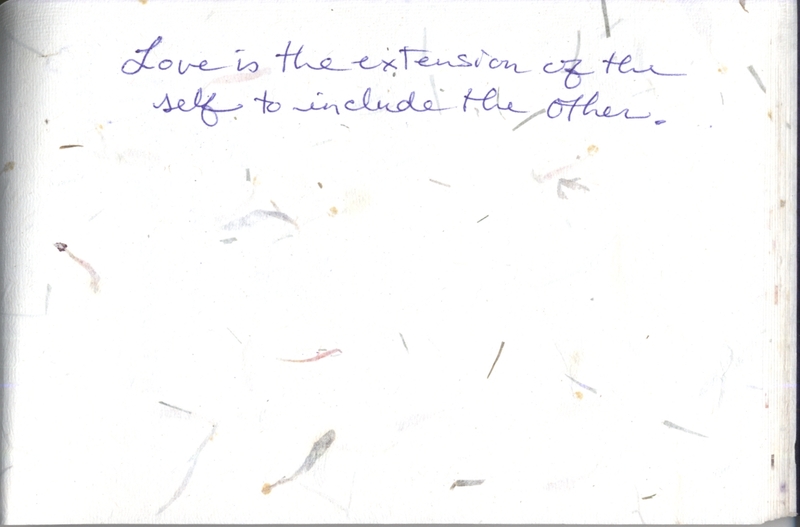 But more than that, it is a movement of awakening and imagination. When the cracks in the dominant ideology become obvious, one has little recourse but to try to bring into being a better world, even in what small ways one can." "I am a single dad who holds 3 masters degrees and am dually licensed in mental health and addictions, as well as, certified as a forensic counselor (meaning I am able to assess persons involved in the courts) handwriting expert/document examiner, massage therapist and yoga instructor. I have 25 years experience with those who have substance abuse issues and criminal conduct and/or mental health issues. I have been a clinical supervisor and program manager for most of this time. I have developed programs that involve making people community minded citizens for those who were deemed antisocial, and produced real change for the supposed revolving door of addiction. Today I have no job. I am faced with a mortgage sized bill monthly to provide health care, that does not cover all my expense. I was terminated from Cobra for being "late" by 3 days though posting my cheque on the month before. I am forced to pay bills that should have been covered by health insurance. New insurance wont allow me to gain benefits for 6 months and I am without molars to chew. I have attempted recourse and reinstatement to no avail. I do not qualify for unemployment since leaving a job is not considered an acceptable reason. I took a 15,000$ cut to work there and got the place credentialed for the first time in 20 years. Though I commuted for one hour and a half each way each day and the job placement more in line with my skills and pay scale was redacted. I was left to manage a program I built from 20 clients to 40 and from one site to two with 2 &1/2 staff. It is currently staffed with 4 levels of supervisors and no more line staff, in fact is now 2 with a census of 12 clients. So why I am here is to point out the fact of the contemporary workplace dilemma. Too few workers too few jobs too many administrators too little integrity too much of an assembly line for clients. Too few opportunities for entrepreneurs. 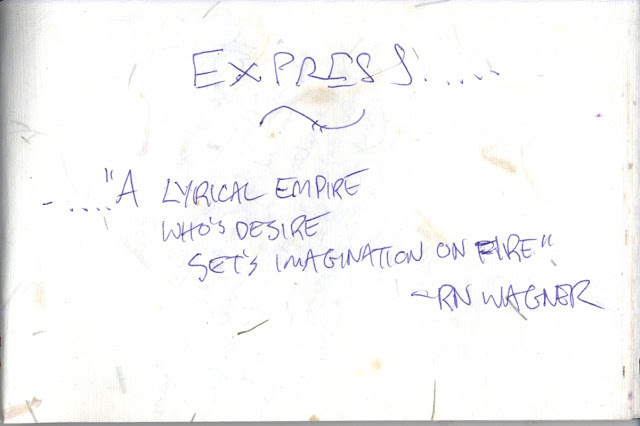 (currently attempting to open an agency with no luck in obtaining grants for much needed womens treatment program). I am here because I have a background in farming and agriculture and am not able to have food sovereignty without monsanto. I am here because corporate media vilifies me for speaking up and asking redress from a bought by corporation government. I am here because I am very concerned about my childrens future and there is no money for their education but we can afford wars. I am here because I am a human being and connection to the earth and the air is important and in my lifetime have gone from self sufficiency and wholesome food to a disenfranchised person in a town where I am not allowed to build a yurt to house my clients and make enough money to live. I applaud Occupy NFLD, we lost our ground here in my town! But I stand with you and if I could would be there on the shores of the beginning of Canada. Je me souviens. Un Canadien toujours"
"While I've not had the pleasure to be at Harbourside Park due to circumstances beyond my control, I wholeheartedly support those of you brave enough to be able to do what you are doing! While I rarely if ever make comments on political situations this movement has hit a chord with me and I find myself getting into lively debates over the movement as a whole. 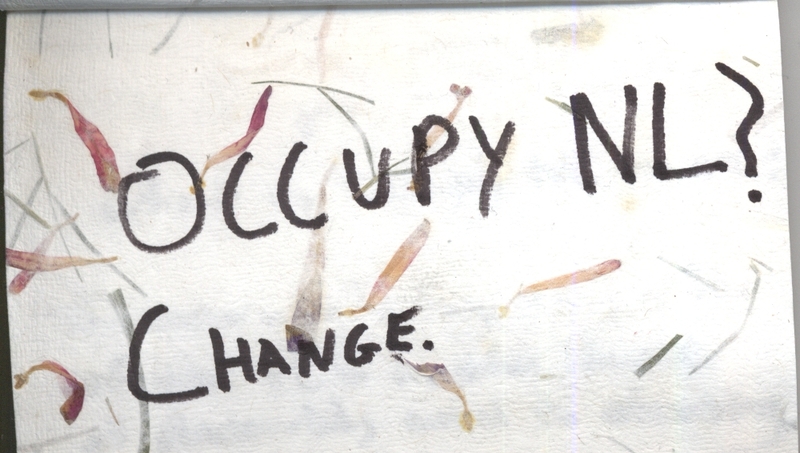 What is the occupy movement and why do you care about it? 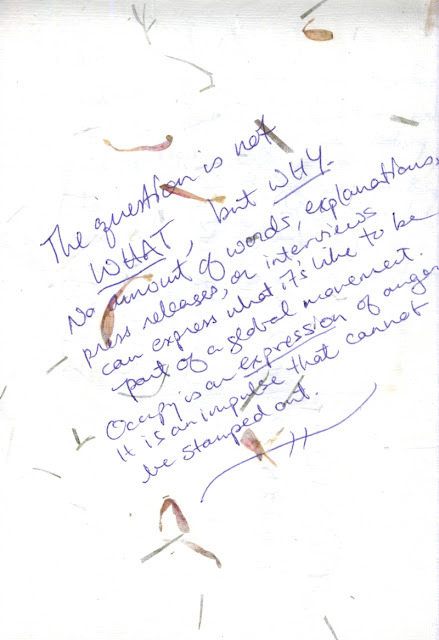 are questions which have been asked a lot of times. Let me paraphrase Amy MacPherson's article: "In a nutshell the Occupy Movement is about the people (99%) no longer tolerating the "trickle down economies" that both the Liberal / Conservative governments support. The government's claim that the tax cuts will help create jobs is asinine because of their manipulation of the system (through deregulation etc) it has ultimately cost the 99% millions of jobs. It has cost us in taxation as well, because we have to bail out the corporations (billionaires) too big to fail. The deregulation of the banking system has defined today's world markets, banking and the monetary structure causing many of us to be unable to shoulder the burden of the increasing cost of living. This trickle down economy we have is eating into our health care, child care, education, pensions, housing, EI and every public/social service we hold dear." Occupy NL is our way to let the government know that they need to have the courage to speak up in the best interests of their people. 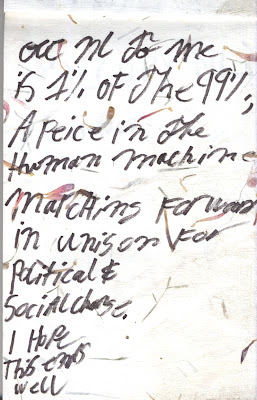 We are all the 99% and we are looking for fundamental change within the system. We need to be able to make a better life for our children, they need to be able to grow and prosper in whatever situation they find themselves, but if this ideology continues I fear for their future." Far more attention is needed in Labrador City/Wabush because the high cost of rents in western Labrador is way out of control not to mention the lack of affordable/low income housing. The federal government should be helping more with this problem too. Single middle-aged men in Labrador City don't have a fighting chance should they have a limited income, in my opinion there's much discrimination, no shelters for single men with no family and again not nearly enough low income/affordable housing available. The wait times are unacceptable, far too long. The high cost of energy, food prices. Canada still has no national housing strategy plan which is seen by the United Nations as a violation of basic human rights. More needs to be done for Labrador City, the need is great and nobody is putting enough pressure on the federal government to do more to help. The Province has only so much money and needs extra federal dollars. A national housing strategy plan is also needed. There's too much wasteful government spending of tax dollars of some things while important things like this are ignored and Canadians shouldn't allow it to continue. Every person from every part Liberals, Conservatives, NDP, all need to be questioned for the upcoming election for a specific plan. I can note that I emailed the Liberal Party of Canada asking what would they do different than the Conservatives with low income/affordable housing two times and never even got a response, same goes for NDP when I emailed on their website, no response which sends a message nobody seems to care enough about this problem and the only way to change this is if more Canadians stand up and speak out about this and get more attention in the media. Labrador west without a doubt needs far more attention. Seems to me the most you hear about in Lab west is all about miners. What about low income people? Some are even middle-aged limited income from disability, what happens to those people with not enough help available?